was published on 12 June 2018. The paper focuses on the future of European democracy. The author of the paper, Ulrike Guérot, is professor at the Danube University in Krems, Austria, and head of the Department for European Policy and the Study of Democracy. Europe needs a new narrative, a new faith – a utopia. The European Union can no longer be maintained in its present state. The people of Europe know that. Half of the citizens want to return to nationalism the other half want more Europe, a different Europe. Increasing populism, however, has reasons to be found in the structures and not among the citizens. 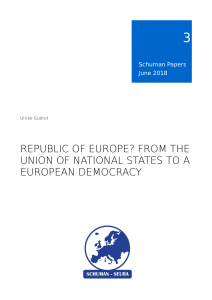 In her article, political scientist Dr. Ulrike Guérot, outlines how the problem of the European Union can be solved with a utopia – the creation of the European Republic. The cornerstone of this utopia is the principle of general political equality. Its application would lead to equality of market participants in the European internal market and would summarise the equality of European citizens. This makes it possible to move from an internal market project to a political community committed to the public welfare of European citizens. In this utopia, the concept of sovereignty, which is leased from the states, is deconstructed and rediscovered as a concept that can be individualized – here one is a Union citizen and a citizen in one – and therefore a bearer of sovereignty. In this sense, the utopia should lead to a new European democracy.